Are you thinking about getting more kale in your diet, but don’t like the taste/texture? Then this recipe is for you! I am right there with you. The first time I tried kale, I gagged. I did not like it’s taste. Up until now, I was able to mask it in smoothies and juice. I also made an occasional batch of kale chips, but that was it. The key to masking the kale is removing the stems and chopping the leaves up fine in the food processor . Even my husband who says he hates kale, ate this salad. I used organic and non GMO tempeh in my recipe, but feel free to replace it with any other protein you like. For those of you that are unfamiliar with tempeh, it is made from fermented soybeans. Fermented soy products contain some health benefits, but they are best used in moderation. 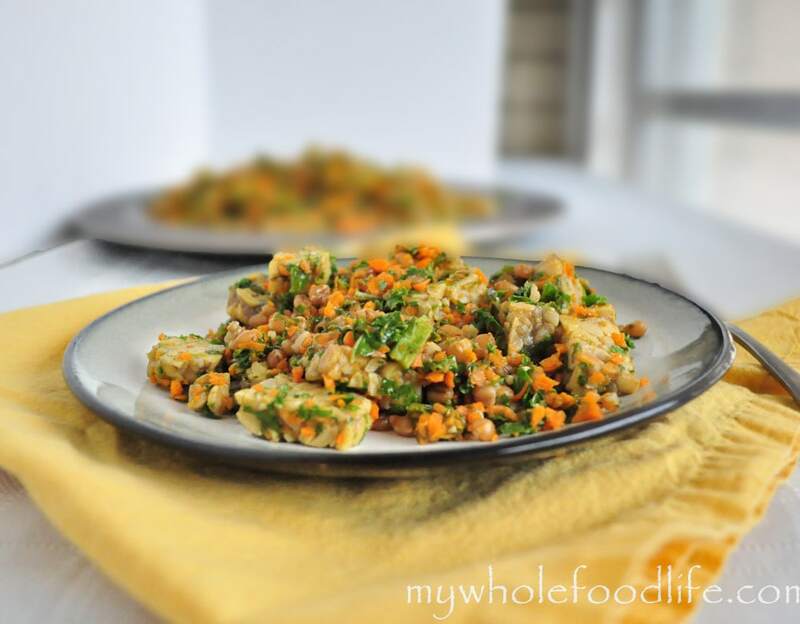 Tempeh has a earthy and nutty taste that goes well with the wheat berries. Also, since most of the soy in this country is GMO, it’s best to look for a brand that is non GMO verified. If you are gluten free, just replace the wheat berries with quinoa and it will be just as delicious! Cook the wheat berries according to the package instructions. I cooked mine the day before I made this salad. Using a food processor , chop the carrots and kale. You may have to do each one separately. In a sauce pan , combine the sesame oil and tempeh and saute for a few minutes on medium heat. Once the tempeh has started to cook, add in the carrots and kale and cook for a couple more minutes. You also may have to add a tiny bit more oil. While all of that is cooking, combine the apple cider vinegar, mirin, soy sauce, garlic, salt and ginger. Lastly, add the cooked wheat berries and the dressing and cook for another minute. Remove from heat and serve immediately or refrigerate for later. Enjoy! Sure! I hope you enjoy it. My kale hating husband ate it up! Not gonna' lie, I have a hard time with straight up, raw kale salads, so hard on the stomach :) This looks awesome and I will probably make it today or tomorrow for lunch. Thanks, Melissa. I love kale, but I've never thought about chopping it that finely before! What a great idea for adding it to grain salads. I'll have to remember this! I also love tempeh. It's probably my favorite protein. Yay! I'm so glad you liked it! I have a couple other wheat berry salad recipes if you are interested. I just love them so much! So glad you liked it! It's one of the only ways I can get my husband to eat kale!